john4jack (Corvallis, Oregon, United States) on 17 November 2009 in Transportation and Portfolio. c'est le paradis des photographe c'est vieille locomotive ! @jamesy: The light was incredible. What a wonderful capture! Beautiful light! @Didier DE ZAN: All of the passengers that day were photographers. BEAUTIFUL capture. I love the colours and tones. Superb lighting. All the photographers in the shot just do it for me - it gives it character. The light and the locomotive are so beautiful! Very beautiful light, colours and composition ! lighting is very good ! great ! Glorious colours..a superbly composed shot. A shot to sit back with and drink my morning coffee to. Stunning colors ! It is superb ! Yes, I'm ready... to go as far as possible. Oh my, that would be amazing to see, my husband would have just loved it! Oh, I wish I had been there. I LOVE steam locomotives! The light is just perfect, BRAVO! This is nice, too ! As nice as yesterday's. Amazing atmosphere and light in this picture!!! I love this one too !! This is wonderful ... photographers at work ... or play, enjoying every minute of it. Another beautiful shot/composition. The golden back light is fantastic. A picture truly sublime! Light, smoke! people! give atosphère fantastic! wow there are so many photographer in this scene, beautiful golden light. Great shot . Love the light and great tones ! This is such a nice series. Keep 'em coming, Jack! What a great photography event. This picture really gives us the feel of that event too! The lighting and tones are wonderful. 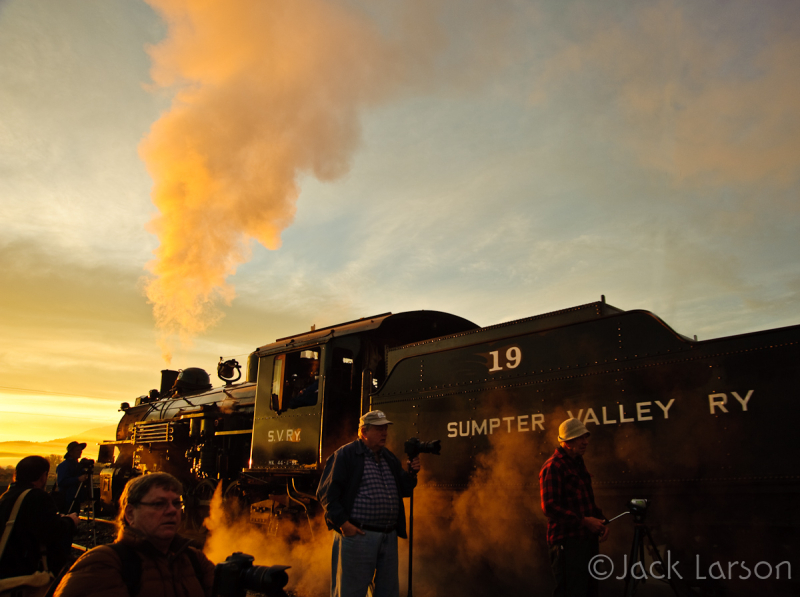 The oblique sunlight and the natural steam and vapor surrounding an engine gives this shot a wonderful mood. One fine image! Another great use of light here. It's amazing how well the steam is highlighted by the sunlight. Superbe image, les couleurs et la lumière sont magnifiques! Bravo! a magnificent steam train, all around us! the colors are superb! That light and that train are gorgeous. I think I better get to Sumpter one of these days. @Steve Rice: Go for one of the photographer's days. Beautiful picture. Have a good day. Antoine. Light is gorgeous in this shot too!!! And love that you shot your fellow photographers......makes for an interesting shot, especially if you didn't know what was happening!!! Excellent light and mood. Must be fun to take that train. @akarui: It was fun, but by the end of the day, it was tiring. The light and tones are exquisite! @Magda: Thank you, and thanks for your comments on all of my recent photographs. wow the mood and light and color in this photo is so amazing! this is my favorite photo right now! Look at all those old-time train buffs out there. I love it! Another gorgeous shot of this beautiful machine, Jack!